Yes this is a pancake! It is sugar free, but that does not mean it is not still delicious. Try it as a healthy lunch or supper dish, as the avocado and sundried tomato topping delivers antioxidants, good fats and omega 3. To make the pancake, whisk together all of the ingredients. Leave to stand whilst you warm a non stick pan around 22cm in diameter. Spray with a little oil if you wish. Pour half of the batter in to the pan and let it set and sizzle. Just lift the edge to see if it has browned, then gently flip it over using a palette knife. Cook for another few minutes. 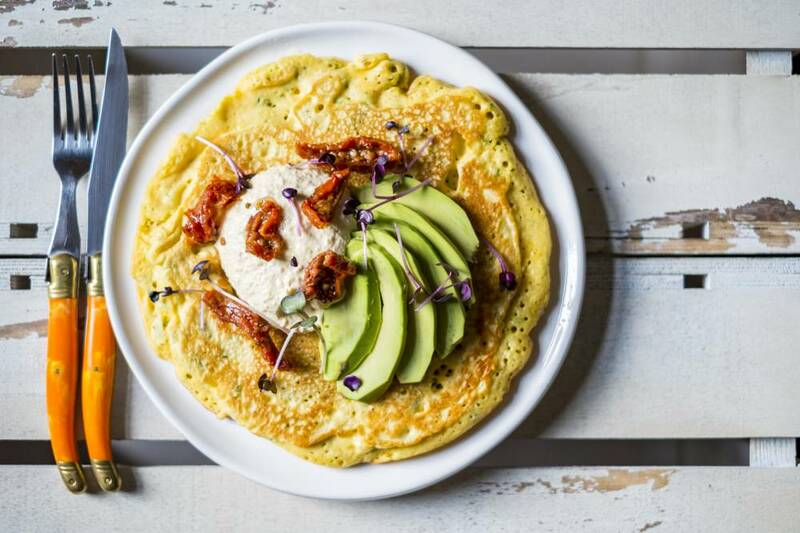 Slide the pancake on to a plate, top with the avocado, tomatoes and hummus then scatter with the herbs.